Some YouTubers were born after web revolution, and have millions of subscribers and maybe website is not important to them. But there are many web owners and companues with popular web portals, just starting to invest in their Video production. Will have free tools that can help to promote your Video content! How to promote YouTube easily? You do not have to know your Youtube channel ID, just paste one youtube link, we’ll find content and automate everything! Use youtube as a Feed source for your widget! Just paste URL of your video, playlist or channel URL, Aklamator will find your video content automatically and populate widget. So you regularly add new videos, how to update web widget? Do not worry, Aklamator update widget with your selected youtube content automatically. Show me the widget! And how to place it? Ok, if you have wordpress, just install Youtube wordpress plugin and drag and drop widget. 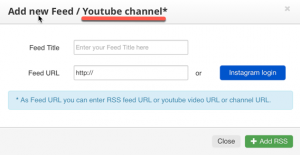 If you do not have wordpress, you can edit your widget and as feed URL just paste desired Youtube video. In order to place widget just copy and paste widget code where you want it. How do the widget look like? Ok, so you have great video explanation, promo video or TV ad campaign, how to use it on a web? Your web visitors, deserve to be able to see that great promo video. Additionally to classic widgets showing content from YouTube channel or playlist, you are able to use our float widgets. You can grab code for float widget from Aklamator dashboard (available for free) or get a Float Video plugin.